Any flavour, any strength, any nicotine. DashVapes is adding another revolutionary option when purchasing e-liquids. We have introduced the ability for you to select what kind of nicotine you want in your e-liquid, for our entire catalogue. Salt-based Nicotine forms naturally in leaf tobacco and is considered to be a more stable form of nicotine than its freebase counterpart. It's taken lots of research to perfect the way we use Nicotine Salts in vaping products today. Salt Nicotine requires higher temperatures to vaporize, and the ions don't easily travel to your nicotine receptors in your body. In layman terms, salts are not the most effective way to deliver nicotine to your body when you compare it to the traditional freebase form, so why is it so popular? When you vape freebase nicotine, 12-18mg would put you on your bum for most people; with Nicotine salts, most people that vape 3mg would be able to handle 25-40mg. This helps mimic the sensation of smoking a cigarette as closely as possible. It helps the nicotine salt vaporize at lower temperatures as well as it lowers the pH levels in the salt nicotine, which produces a much smoother throat hit. It produces a chemical reaction which allows the salt nicotine to be more absorbable - similar to freebase nicotine. This allows you to vape high nicotine levels comfortably, and it also makes it easier for your body to absorb nicotine, contrary to the nature of nicotine salts. 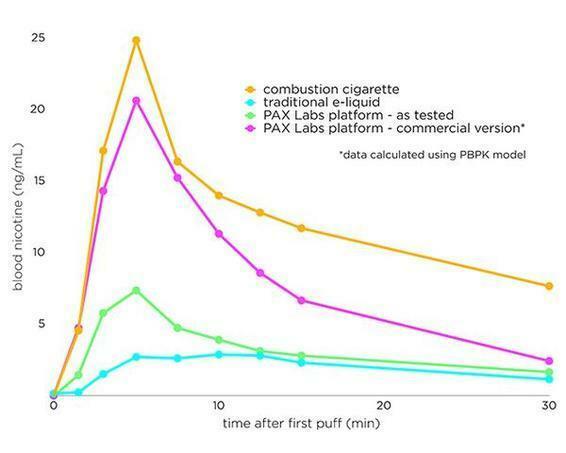 Pax Labs created a graph that shows that nicotine salt e-liquid can help you deal with your cravings more effectively than freebase nicotine e-liquids. When you compare Freebase Nicotine and Nicotine Salt when it comes to vaping, the biggest difference is how it affects your vaping experience. One noticeable difference is the harshness created by higher nicotine levels. Freebase nicotine contains a higher pH level which affects the alkalinity, what this does is it makes freebase e-liquid harsher as you raise your nicotine strengths. Nicotine salts have a lower alkalinity due to the added benzoic acid, which gives you a reportedly smoother throat hit and makes vaping 40mg nicotine enjoyable. One other difference is although salt based nicotine is known to not be the most effective way to deliver nicotine to your body, the Benzoic Acid makes the Nicotine Salt absorb even more effectively than freebase. Why would I use Freebase if Nicotine Salt is so good? Nicotine Salt e-liquid should only be used on low-powered devices. You should never ever use Nicotine Salt e-liquids in a high powered device (or in a sub-ohm setup). Nicotine salt is extremely difficult to chain-vape, you'll quickly start feeling effects of over-nic when you do. Who should use Nicotine Salt? Nicotine salts are a great alternative for smokers who are having trouble kicking the habit. Nicotine Salts resemble the experience of smoking a cigarette more closely than that of freebase nicotine. If you want a low-power inconspicuous device that you can easily take on the go, nicotine salts are effective in curbing your cravings in such devices, whereas freebase nicotine may feel unsatisfying. As mentioned above, it is strongly recommended to avoid using high powered devices to vape salt nicotine. Using sub-ohm setups to vape salt nicotine at 40mg will give you excessive amounts of nicotine and would be extremely unpleasant. Salt Nicotine is designed to be used in lower wattage, high nicotine setups. Not only are these devices low profile and sleek, but most of the low wattage devices also are button-less and fire when you inhale (similar to a cigarette), this makes it a user-friendly alternative for new vapers. You can consider using low-levels of nicotine salt in sub-ohm setups, however, research has shown that nicotine salts only provide benefits at high-concentrations, and you would be better off to use freebase nicotine in these instances.